Emission Mössbauer Spectroscopy (eMS) measurements, following low fluence (<1012 cm−2) implantation of 57Mn (t 1/2 = 1.5 min.) into ZnO single crystals pre-implanted with Ar and C ions, has been utilized to test the sensitivity of the 57Fe eMS technique to the different types of defects generated by the different ion species. The dominant feature of the Mössbauer spectrum of the Ar implanted ZnO sample was a magnetic hyperfine field distribution component, attributed to paramagnetic Fe3+, while that of the C implanted sample was a doublet attributed to substitutional Fe2+ forming a complex with the C dopant ions in the 2− state at O vacancies. Magnetization measurements on the two samples, on the other hand, yield practically identical m(H) curves. The distinctly different eMS spectra of the two samples display the sensitivity of the probe nucleus to the defects produced by the different ion species. 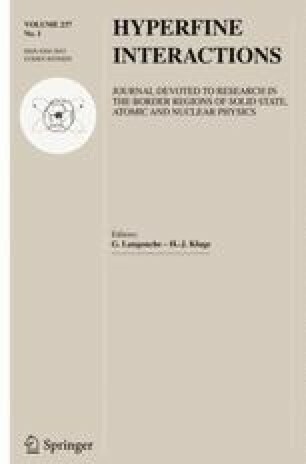 This article is part of the Topical Collection on Proceedings of the International Conference on the Applications of the Mössbauer Effect (ICAME 2015), Hamburg, Germany, 13-18 September 2015.